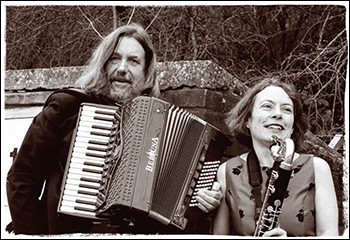 Pagoda Project is a duo comprising Paul Hutchinson (piano accordion) and Karen Wimhurst (clarinets). And neither of them sing (except with their respective instruments of course, you might say). Lest the thought of a whole album of nothing but accordion and clarinet duets fill you with trepidation, I must entreat you to read (and listen) on. It will help you to learn that the protagonists are both hugely talented and versatile musicians and share a love of all things musical, and with a wicked – and intelligent – sense of humour to match. Anyone who’s come across Paul from his long-term tenancy with Belshazzar’s Feast and Hoover The Dog will know the kind of thing to expect – i.e. ebullient yet sensitive playing, with infectious, well-pointed rhythms, and a talent for taking tunes off into creative tangents, a real gift for affectionate pastiche, and a keen understanding of all manner of folk and world musics, classical and jazz disciplines. Oh, and a delicious sense of wordplay – which surfaces in the titles of his compositions (It Takes Three To Tango, Life In The Bus Lane …). For Paul’s also a gifted composer in his own right, as is Karen.